Welcome to Bella Cavalli Farms! Bella Cavalli (“Beautiful Horses”) is a 50 acre ranch located to the West and just outside Solvang, California in the beautiful Santa Ynez Valley and just over the San Marcos pass from the City of Santa Barbara. Entry to the ranch is from Highway 246 through a large white stone façade framed with wisteria, red roses and featuring a mission bell. The entrance road is long and straight for a quarter mile and bordered with trees and roses. 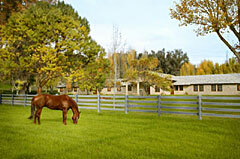 The entire ranch, from the pastures to the home and all the structures, has recently undergone a complete renovation. The show barn was redesigned in a French Country Style and finished with a hand cut stone exterior and slate roof. The existing home and office building were remodeled in the same style. All pastures were replanted and underground sprinklers and safety fencing installed. Ten acres of the Ranch have been recently planted to wine grapes and in several years a winery will be built to produce estate bottled wine. Construction of a half mile training track with competition style railings was recently completed. Bella Cavalli has a number of ongoing activities. A major discipline of the ranch is its Lay-up, Rehabilitation and Reconditioning Center where horses engaged in physically demanding activities can find ample amounts of quiet green pastures and large comfortable stalls for the rest and recuperation that rejuvenates them. 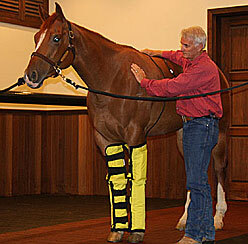 Since a number of these horses also have minor soft tissue probles such as tendon and ligament injuries, among others, Bella Cavalli has a full Rehabilitation Unit within the Center to treat these problems and help them back to full performance and productivity. In addition to the above, Bella Cavalli offers to horse training clients a safe and professional equestrian facility specializing in Reining, Dressage, Jumping and English disciplines. The professional staff of the ranch, with over thirty years of experience, carefully evaluates each client and horse as to its strengths and weaknesses and then helps develop individualized programs to maximize their capabilities. The size of the training facility lends itself to maximum efficiency and allows additional personalized care for the horses and an elevated level of communication between owners, clients and training staff all of which ultimately contribute to increased success in the arena. Bella Cavalli, with its pastoral scenery blended into its professional working ranch ambience, is often used as a backdrop for various activities such as weddings, private parties, reunions, benefits and corporate seminars. This natural beauty, along with its proximity to the world class amenities found both in Santa Barbara and the Santa Ynez Valley, make Bella Cavalli a treasured destination on any travel itinerary. For detailed information about the Bella Cavalli Lay-up, Rehabilitation and Reconditioning Center, please make a selection below.